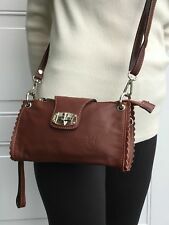 NWT Genuine Italian leather clutch/cross-body handbag in chocolate brown from Florence, Italy. (Color as seen in 1st photo). Gorgeous super-soft cow skin leather can be worn as a cross-body bag with long strap or clutch with wrist handle. NWT Genuine Italian leather clutch handbag from Florence, Italy. 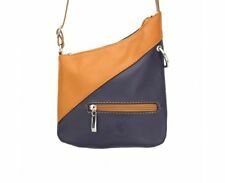 Gorgeous super-soft leather crossbody bag with long adjustable strap. Top zipper closure with one front zip pocket and inside zip pocket. Genuine Italian Vera Pelle Leather by Bagitali. Twist clasp Strap & Zip closure, fully lined with inner zip pocket. Single adjustable crossbody strap. This beautiful handbag is made out of high quality genuine leather. Polished Silver tone hardware. Zipper Slip Pocket on the back. BLACK jacquard lining. OR YOUR MONEY BACK. Single adjustable crossbody strap. This beautiful handbag is made out of high quality genuine leather. Polished Silver tone hardware. Zipper Slip Pocket on the front and back. Top Zip closure. Black jacquard lining. Small tan coloured leather handbag by Vera Pelle. Vera Pelle Italian Leather Shoulder Bag Genuine Ladies Handbag Burgundy/Red. **Has little tiny scratche. Good used condition. Black Italian Leather Cross Body Handbag. Adjustable shoulder strap can be worn on the shoulder or across body. Genuine Italian Leather by Bagitali. Strap length at the longest 140cm. Small green leather cross body shoulder bag made with 100% real genuine leather. Slim design detachable long shoulder cross body strap. Small shoulder bags take up much less space and are very functional. BRAND NEW WITHOUT THE TAGS!! NEVER USED! VERY CUTE LEATHER CROSSBODY IS IN PASTEL OINK WITH BROWN! IT IS MADE IN ITALY! HAS ZIPPERED POCKET INSIDE! THIS IS A LIGHT PINK PASTEL COLOR! LOOKS LIKE A SMALL SATCHEL PURSE. Distressed tan leather bag with muted gold hardware throughout. Decorative buckles on sides and front. Front of bag has two side zipper pockets with large zipper pulls. Backside has one large zipper pocket with large zipper pull. NEW VERA PELLE BLACK GENUINE ITALIAN LEATHER,ZIP,FLAP,CROSSBODY HANDBAG. Single adjustable crossbody strap. This beautiful handbag is made out of high quality genuine leather. Top Zip closure under the flap. Small black leather cross body shoulder bag made with 100% real genuine leather. Slim design detachable long shoulder cross body strap. Small shoulder bags take up much less space and are very functional. Italian real suede c lutch bag in black. and the fact that these clutch bags are handmade using traditional techniques. made with love by. Add to Favourites. Vera Pelle. Small knicks to pipping on bottom side-See Last Pic. Missing Inside Label. Slim design detachable long shoulder cross body strap. Small blue leather cross body shoulder bag made with 100% real genuine leather. Small shoulder bags take up much less space and are very functional. Small grey leather crossbody shoulder bag made with 100% real genuine leather. Slim design detachable long shoulder cross body strap. Small shoulder bags take up much less space and are very functional.